On my continuing re-read of Austen, I’ve ended up today at one of the more famous scenes in Pride and Prejudice. No, not the wet shirt appearing from the lake at Pemberley, the first proposal by Mr. Darcy. Since so much of this re-read seems to involve me pointing out how I’d misremembered things (and partly blaming the excellent 1990s adaptation), I should probably admit that this scene surprised me. I had roughly remembered it as a moment of miscommunication, when Lizzie and Darcy recognised the powerful feelings they had towards each other, but were still too caught up in the “pride” and “prejudice” of the title (as well as the subplots of Jane and Wickham) to accept the situation. It opened a new act in the novel by having Darcy admit his love, allowed the rest of the action to be directed towards getting them back to this point (but as people who could marry each other) and obviated the need for a big declaration of feelings at the moment when they actually did become engaged. Elizabeth’s astonishment was beyond expression. She stared, coloured, doubted, and was silent. This he considered sufficient encouragement; and the avowal of all that he felt, and had long felt for her, immediately followed. A considerable burn on Darcy from Austen, there. “This he considered sufficient encouragement…” The breakdown in communication is not caused by his internal emotional struggles, or indeed by repressive social norms, but by male entitlement to women’s attention. Particularly effective because it shifts the attention from Darcy as the heroic possessor of uniquely troubled feelings which must find expression to Darcy as (in a telling line from the 1990s script) “your average rich man, used to his own way”. The emotional balance between the individual and the social, explored more explicitly by Austen in the title and plot of Sense and Sensibility, is tipped in one direction here. Not that Darcy isn’t tempting. Nor does Lizzie come out of all this with unblemished integrity. “In spite of her deeply-rooted dislike, she could not be insensible to the compliment of such a man’s affection”. Once again the personal and the social are set in friction, with Lizzie’s feelings about Darcy himself swamped for a moment by an awareness of what Charlotte Lucas calls “his consequence”. Or, in her mother’s words, “What pin-money, what jewels, what carriages[…]!” In the absence (and indeed the abs-ence) of an actor like Colin Firth on the page, “such a man” sounds suspiciously similar to the ideas readers are used to condemning in Mrs. Bennet’s mouth. Again, it is Darcy’s conformity to social conventions (and related hypocrisies) which Austen chooses to underline. Not that there isn’t a struggle – as he claims earlier – between his true feelings and those which are acceptable to express. It’s just that, at this moment, he is constrained to declare that she has power over him, and his true feelings are those of a rich, well-connected man who knows he has power over her. A oddly precise reversal of the Byronic role in which Darcy is keen to cast himself, and which so many readers and viewers accept. Of course, he does have strong romantic feelings for Lizzie, and they do clash with his social position and his family’s expectations of him. As part of adopting the Byronic role, Darcy makes it clear how his love surmounts all obstacles and constraints. (A trope familiar from the European literary discourse of love since the time of the troubadours and “courtly love”, whose exemplars so often demonstrated the socially transgressive power of fin’amor by directing their affections towards those socially inaccessible and/or married to other people.) He does more than make it clear. It is ground-bass and the burthen of his love-song. He spoke well; but there were feelings beside those of the heart to be detailed; and he was not more eloquent on the subject of tenderness than of pride. His sense of her inferiority – of its being a degradation – of the family obstacles which had always opposed to inclination, were dwelt on with a warmth which seemed due to the consequence he was wounding, but was very unlikely to recommend his suit. Austen’s shift in viewpoint – or perhaps we should say her use of shifting indirect discourse to the point where viewpoint is irrelevant – is very subtle here. Who is making that judgement in “He spoke well”? Is it the author’s neutral tone describing the skill of a speaker within her text? (Though “neutral” is hardly the term for an author who drops into an evaluative and non-emotional tone at this point in this kind of scene. Nor for an author who chooses to relate that fact whilst not allowing the reader to hear his eloquence being exerted in ways which might convince them.) Is it Lizzie, who even in a moment of turmoil like this can’t stop herself from assessing someone’s fine use of language and aptness of observation (particularly when that observation is directed initially towards the splendour that is Lizzie…)? In either case, by the time the sentence ends we are closer to Darcy’s consciousness. It is his judgement that there are other things to be detailed beyond the temperature of his ardour. This bringing together of perspectives within one crucial sentence – Lizzie’s, Darcy’s and the narrator’s – might alert us to the range of satire being carried out here. Or at least the potential range of targets. This scene is pretty puncturing to Darcy, specifically to his view of himself – and the view which many readers take of him – as the conflicted Romantic hero. As we’ve seen, it also shows Lizzie being susceptible to the attractions and privileges which have let Darcy act in this way. I think there’s a larger point about love and literature being explored as well, though. The major reason Lizzie becomes angry at his proposal is not his smirking awareness of the odds of an acceptance (though that hardly helps), but his disastrously expansive dwelling on “the family obstacles which had always opposed to inclination”. The literary satire is less sharp and obvious than Northanger Abbey. (Though I think that book’s satire is much more subtle than it is often given credit for.) But I think there is a very Austenesque testing of the literary conventions of love here, which we can see in Northanger, and a probing of the social assumptions it, which we recognise from Sense and Sensibility. The language in which individual passion expresses its contempt for social convention is itself a social convention, and Austen does not let us forget this fact. Darcy’s proposal, and Lizzie’s furious refusal, teasingly stages the script of swooning, individualist, “the world well lost for love” romance. But instead of dousing it with a bucket of cold reality, Austen lets it play out, revealing the contradictions within the script. Lizzie finds she doesn’t want a man to explain why she’s such an unsuitable choice but he must have her, he must, damn her bewitching ways. Darcy discovers you can’t indulge your feelings of ineffable superiority by condescending to the woman you love and expecting her to be grateful. (Unless you wish to remain both ineffable and uneffed.) The love-drama goes wrong and everyone ends up feeling as if they’ve been wronged. (Does that everyone even include the narrator – as opposed to Austen – who has conscientiously carried through the conventions of this scene, including both the love and the “other feelings to be detailed”, and found it all fell apart?) Showing a surprisingly Marxist streak, Austen triumphantly illustrates the dominant social ideology collapsing under the strain of its internal contradictions. As well as revealing how that language fetishizes men’s social and economic power over women, whilst pretending that women have the upper hand. This satirical testing of the social languages of love, and the disruption it entails of Darcy’s image as heroic lover, sent me back to the other proposal Lizzie has already refused by this point. The courtship of Mr. Collins, the rector who wants to put some shelves in your closet. As I’ve written earlier in this series, I’m increasingly reading the unappealing Mr. Collins less as a foil to Darcy’s wonderful looks and superb character than a parallel who demonstrates themes which also affect our reading of Pemberley’s master. I think it’s worth bringing his proposal into this discussion because of its similarities, rather than its differences, when put next to Darcy’s turbulent declaration. first, that I think it a right thing for every clergyman in easy circumstances (like myself) to set the example of matrimony in his parish; secondly, that I am convinced it will add very greatly to my happiness; and thirdly – which perhaps I ought to have mentioned earlier, that it is the particular advice and recommendation of the very noble lady whom I have the honour of calling patroness. Where Darcy “sp[eaks] well” and “represent[s] to her the strength of that attachment which, in spite of his endeavours, he had found it impossible to conquer”, Mr. Collins thinks it wise to explain the reasonableness of his proposal “before I am run away with by my feelings on the subject” and later states that” And now nothing remains for me but to assure you in the most animated language of the violence of my affection” without actually doing so. Allow me, by the way, to observe, my fair cousin, that I do not reckon the notice and kindness of Lady Catherine de Bourgh as among the least of the advantages in my power to offer. You will find her manners beyond anything I can describe; and your wit and vivacity, I think, must be acceptable to her, especially when tempered with the silence and respect which her rank will inevitably excite. This all seems very far from Darcy’s noble assurance and independence, until we remember that it is Lady Catherine de Bourgh who embodies the family scruples against which he is throwing his love into relief. His marital rhapsody is just as much about the crabby Lady Catherine as Mr. Collins’ obsequious encomium. Both are apparently convinced that Lizzie will be unbearably aroused by them explaining how they feel about this elderly noblewoman and her snobbery. Indeed the main difference, on reflection, between Mr. Darcy and Mr. Collins is that the latter’s proposal suggests that he actually wants to marry her and thinks it would be a good idea and nice for everyone if they were married. Of course he’s also arrogant, petty, conceited, over-bearing, probably hypocritical and would make a terrible husband for Lizzie. And Charlotte Lucas’ future life at Hunsford looks really bleak from what we see and hear of it. But Mr. Collins’ proposal cannot comfortably be read as the polar opposite of Darcy’s, a trial through which Lizzie passes with fortitude and integrity, to be rewarded with the other man’s attentions. The parallels between the two scenes mark them, I think, as illustrations of two failed approaches to love and social interaction. You cannot argue someone into marriage by showing them what a good idea it is, as Mr. Collins shows. But nor can you argue them into marriage by showing what a terrible idea it is, as Mr. Darcy shows. When placed next to each other, the two proposals carry out the testing of romantic and social languages which I identified within Darcy’s speech. The language of casting all to the winds and defying the world is shown to be just as conventional, rule-governed and systematic as the language of family alliance, suitability of station and financial convenience. Perhaps they are not “failed approaches” precisely, but sketches of the two approaches suffering under the strain of their own internal logic. Though he doesn’t quite believe in it enough, as his disingenuousness at the end shows. 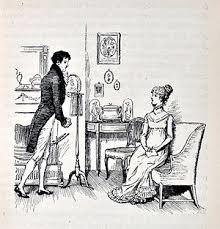 Is there a hint that though Darcy has not yet achieved emotional honesty – to borrow a phrase Catriona Soutar used recently to describe one of Austen’s prime values – he has at least achieved a level of self-awareness which might one day enable honesty? Does his hypocrisy signal his awareness that other people do actually have consciousnesses, a fact which escapes too many of Austen’s characters?